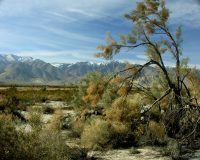 A primary aspect of Anza-Borrego Foundation’s mission is to conserve land by purchasing it from willing sellers and adding it to Anza-Borrego Desert State Park. When the Park was formed in the early 1930s, it was checkerboarded by thousands of acres of private land inholdings — one estimate is as high as 60,000 acres, which is 10% of the current Park! Since 1967, ABF has acquired more than 54,000 acres of those inholdings and other properties to add to the Park. Acquisitions have been in critical areas such as Borrego Palm Canyon, Coyote Canyon and the Borrego Badlands, an area rich with paleontology. Looking to the future, ABF actively pursues acquisition of the remaining inholdings to make our Park whole and conserve wilderness areas in perpetuity. We would like to thank RSR Law Group LLP, who provides substantial in-kind support to our acquisition and biological mitigation efforts. 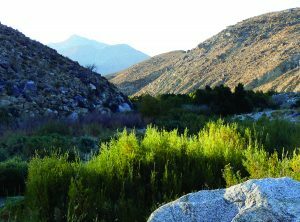 Since 1998, ABF has been able to acquire several major ranch properties that park planners long ago had hoped would become part of Anza-Borrego Desert State Park. 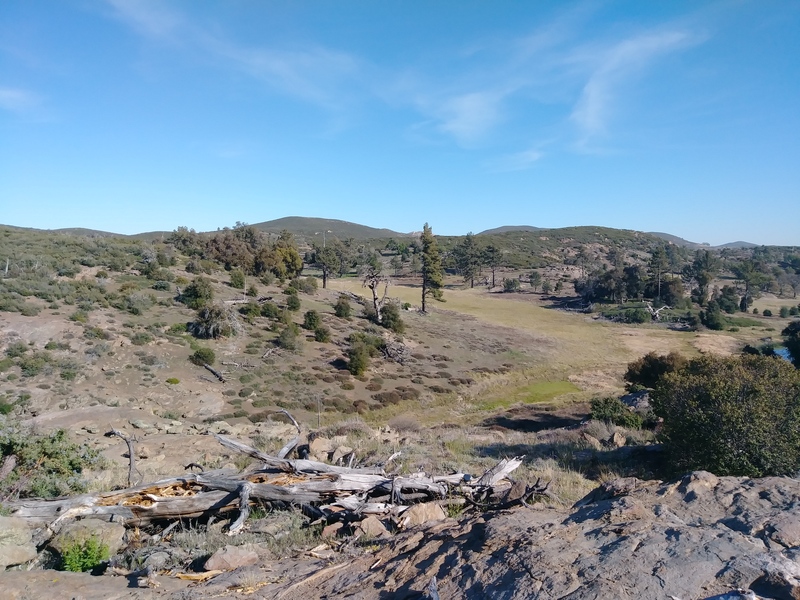 These properties represent land values in excess of $23 million — a phenomenal commitment by nonprofits, government agencies and individuals intent on preserving California’s wild lands. 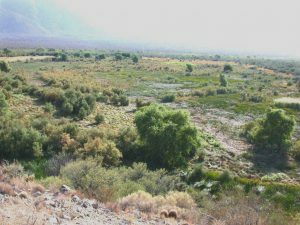 Below are some examples: Sentenac Canyon and Cienega: This rare desert wetland area is located near Scissors Crossing, the junction of highways S2 and 78. Funding for the 1,723 acres was provided by state and federal agencies, regional foundations and individual donors. 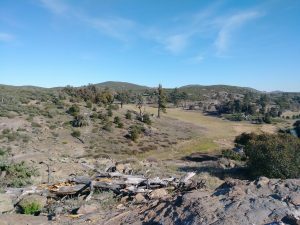 Lucky 5 Ranch: In 2001, the purchase of 2,675-acre Lucky 5 Ranch created a wildlife corridor between Anza-Borrego Desert State Park and Cuyamaca Rancho State Park, a mountain habitat. Funding was sparked by a $2 million anonymous donation and state and federal funds. In 2015, ABF acquired an additional 1,129.5 acres of the Lucky 5 Ranch and gained a conservation easement over the existing ranch house. In total, the 4,200+ acre parcel now provides a connection between the parks and Cleveland National Forest to the south. Mason Valley: In 2002, 842 acres of Mason Valley became part of Anza-Borrego Desert State Park. Major funding was provided by the National Fish and Wildlife Foundation, Proposition 40, foundation grants and individual donations. Vallecito Ranch: The historic 3,339-acre Vallecito Ranch, a critical habitat for over 50 rare and endangered species of plants and animals, was purchased in 2004. Funds were provided through Resources Legacy Fund Foundation’s Preserving Wild California program, The Nature Conservancy, state and federal programs and individual donations. Horse Canyon: In 2004, ABF and the Native American Land Conservancy jointly acquired and transferred to the Park 1,298 acres of Horse Canyon. The canyon, a tributary of Coyote Canyon, contains important archaeological sites and is part of bighorn sheep habitat. 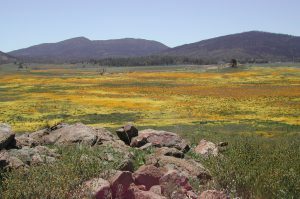 Tulloch Ranch: Another wildlife linkage was made with Cuyamaca Rancho State Park in 2005 when the 2,080-acre Tulloch Ranch was added to Anza-Borrego Desert State Park. Funding was provided by state and federal programs and a private foundation grant. Anza Trail Initiative: In 2006, the Anza Trail Initiative was launched to raise funds for the acquisition of inholdings located along the viewshed of the historic Juan Bautista de Anza Historic Trail, the route followed in 1775 by California’s first immigrants. Major funding is provided through the Resources Legacy Fund’s Preserving Wild California program and by California State Parks. Over 3,000 acres have been acquired so far and we are working on the remaining approximately 7,000 acres. To learn more or support the effort, please contact Julie Gerson at (760) 767-0446 ext 1007.